Please accept my blessings. I beg to thank you very much for your kind letter dated 2nd July, 1971 and I have noted the contents carefully. I am so glad to hear that you have visited Vrindaban and that my manuscripts are safe under lock and key and that the old business transaction files have all been burned. Thank you very much. Yes, it is encouraging news that J. Dalmia is favorably inclined toward giving us land in Raman Reti. So let me know when things are finalized. Also two sets brass Deities were promised by the trust. What has happened to them? Another nice news is that all of you women are going out daily for preaching. Very good. Continue it whole heartedly. Yes, Krishna may wear dhoti: why not? So far as naming the Deities in London, that I will see to when I go there, sometime in the first week of August. Please accept my blessings. I beg to thank you very much for your kind letter dated 7th July, 1971 and you will be glad to know that I have accepted you as my duly initiated disciple. Your beads have been duly chanted by me and are being returned personally by Jagadisa Prabhu, who is here now in N.Y. I have given you the spiritual name Krpasindhu Das Brahmacari. Krpasindhu means Krishna, the ocean of mercy. I am so glad to note how you have been following the regulative principles strictly for the past six months and chanting at least 16 rounds of beads daily, as well as going in Sankirtana regularly. Thank you very much. 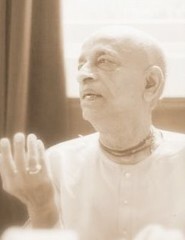 That is our very strength in spiritual life and if you continue to do so, along with reading all our literatures and attending classes and aratis, then your rapid advancement in Krishna Consciousness will be certain. So my request to you is that you work very enthusiastically and in cooperation with Jagadisa Prabhu and make our Toronto center a grand success. Please accept my blessings. I beg to thank you very much for your kindly presentation of $20.00 for my book fund. We require such funds so that we can print our books and over-flood all of the world with Krishna Conscious literature. That is the goal. I am so glad to hear that you have been staying at our St. Louis center under the expert guidance of Sriman Vamanadeva Prabhu and have been chanting 16 rounds of beads daily. Continue to do so faithfully and follow all the regulative principles of devotional life. If there are any questions, refer them to your god-brothers and sisters. And just as soon as you are recommended for initiation by Vamanadeva, I will be glad to accept you as my duly initiated disciple. I am so glad to hear how successful our Rathayatra festival was, with nearly 10,000 people participating in the procession. And the police were very pleased with our cooperative spirit. Very good. I have received similar report from Nara Narayana Prabhu about the festival and I am so much appreciative to you all for your sincerely working to make this year's Rathayatra festival a grand success. Thank you very much. I am also glad to note that a meeting of all the presidents was held just recently in order to unify the temples. That is the process. Unless we work cooperatively, how this movement will go on? So my request to you all is that you maintain that spirit of cooperation always and help me to deliver Lord Caitanya's message all over the globe. You say in your letter that you have arranged a press conference for our arrival there in London on 1st August; I think Syamasundara. Prabhu has written you that we are scheduled to be in N.Y. for one engagement on the 1st August. So keep the date for the press conference open and when the final date has been fixed up I will let you know. Probably it will be on the 2nd or 3d of August. I have received the bead bag made by Malati, the karatala pouch made by Dinadyadri, the sweets and breads made by Mandakini, Aditi, Jill and Clare, the photos of the festival taken by Serge, and photos of the very beautiful paintings done by Vasudeva. All these presentations are so very nice. You are all so kind to me. Thank you very much. Also one letter has come with the signatures of all the London devotees. Please offer them all my blessings. Hoping this will meet you all in good health.